Telephone Reassurance Program featured on Channel 6 News "Acts of Kindness" series! We continue to welcome new volunteers and members to join! Bishop Sullivan Center and the Mr. Goodcents Foundation have partnered with the Jayhawk Area Agency on Aging to bring Project ElderCool to eligible Lawrence residents. Project ElderCool's mission is to provide a window air conditioner unit for a low income elderly person who is without one. Community Village Lawrence, in cooperation with area organizations, is working to coordinate volunteers to help install twenty-five LG 5,000 BTU air conditioners in homes of Lawrence residents. If you are interested in helping with the installations, or know someone who may qualify for the program, please contact Community Village Lawrence by calling 785-505-0187 or emailing info@communityvillagelawrence.org. 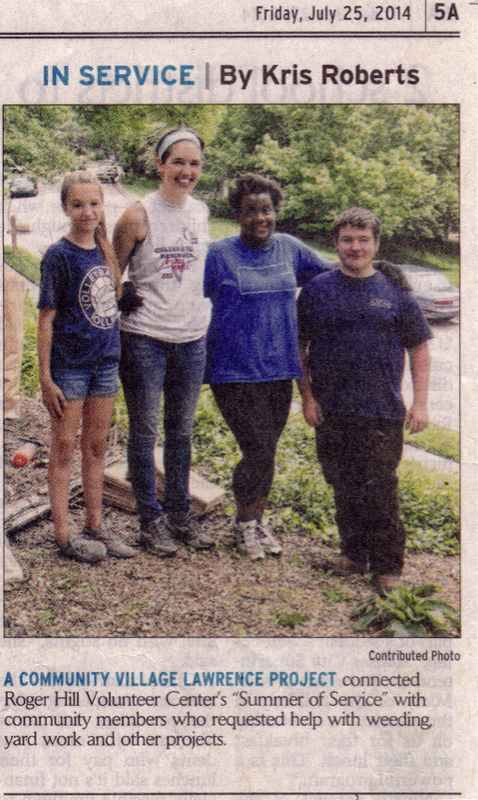 We are happy to have had our volunteers from Roger Hill Volunteer Center‘s “Summer of Service” featured in the Lawrence Journal-World‘s “Friends & Neighbors” section! Thank you to RHVC for this great opportunity!